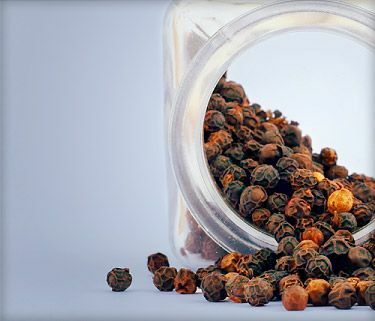 May 4, 2012 -- The same ingredient in black pepper that makes you sneeze may help keep you slim. A preliminary new study suggests that the pungent component in black pepper known as piperine fights fat by blocking the formation of new fat cells. If further studies confirm these effects, researchers say black pepper may offer a natural alternative for the treatment of fat-related disorders like obesity. "Our findings suggest that piperine, a major component of black pepper, inhibits fat cell differentiation ... thus leading to its potential use in the treatment of obesity-related diseases," writes researcher Ui-Hyun Park of Sejong University in Seoul, Korea, in the Journal of Agricultural and Food Chemistry. Researchers say the benefits of black pepper and the black pepper plant have been known for centuries in traditional Eastern medicine, in which it is used to treat cholera, diarrhea, and other gastrointestinal issues. Even so, little is known about how black pepper works within the bloodstream that might explain these beneficial effects. In their study, researchers looked at the effects of piperine on gene expression in fat tissue in the lab and in computer models. The results showed that piperine interfered with the activity of genes responsible for forming new fat cells. Researchers say this benefit of black pepper sets up a chain reaction that helps keep the formation of fat in check in other ways as well. "Overall, our results suggest that piperine could be a lead natural compound for the treatment of fat-related disorders," the researchers write. Park, U. Journal of Agricultural and Food Chemistry, May 2, 2012.